We are all born for a purpose, though sometimes it is not clear to us what it is. In this tale of good versus evil, cousin versus cousin, Prince Arjuna knew that his purpose, his dharma, was to fight in the battle against the greedy and cruel king Duryodhana. Yet his own relatives and friends were on the opposing side. 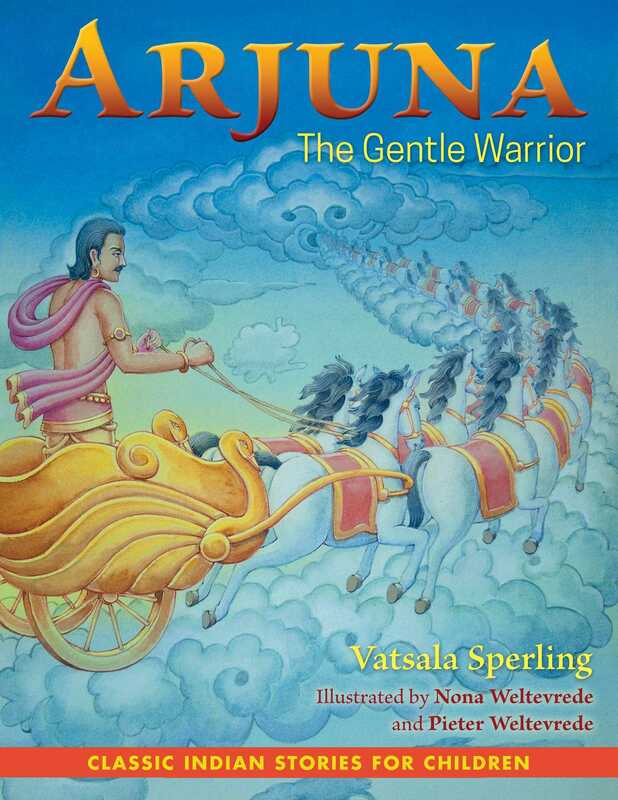 With a lot of soul searching and divine advice from the god Krishna, Arjuna bravely chooses to fulfill his destiny as a warrior with compassion and kindness, restoring peace, justice, and prosperity to his kingdom. This adaptation for children of the classic epic the Mahabharata is beautifully illustrated with paintings created in a centuries-old method traditional to India. Richly detailed, the paintings bring to life the colorful cast of characters as well as Arjuna’s inner conflict and the trials he faces on the path of loyalty, justice, and peace. Vatsala Sperling, Ph.D., fluent in a number of Indian languages and Sanskrit, learned these traditional stories at her mother’s feet and enjoys introducing them to children of the Western world. Before marrying and moving to the United States, she was the chief of Clinical Microbiological Services at the largest children’s hospital in India. She is the author of How Ganesh Got His Elephant Head, How Parvati Won the Heart of Shiva, Ram the Demon Slayer, Hanuman’s Journey to the Medicine Mountain, Ganga: The River that Flows from Heaven to Earth, and Karna: The Greatest Archer in the World. She lives in Vermont with her husband and son. Nona Weltevrede got in touch with Indian culture at a young age by watching his father and his mentor, Harish Johari, paint. A graduate of the Dutch Academy of Art and Design, St. Joost, he lives in Buren, Holland. Pieter Weltevrede began his artistic studies with Harish Johari in 1977 and also studied with Shri Chandra Bal. He lives in Holland with his wife and two children and travels to India annually.